When it comes to business, Doosan don’t just sell trucks, they provide the complete package, ensuring their customers are the priority. Doosan is now in the envious position of being able to offer a fantastic local proposition through the best dealer network in the UK and a service and cost reduction focused opportunity to the larger fleet and multi-site users. Our dealer network is located around the entire UK from Cornwall to Aberdeen and Belfast to Kent, providing the best possible service, through local support and fast response and is often able to respond to the needs of local businesses better than centralised call-centres. However, if you operate a larger fleet or have numerous sites across the UK, Doosan has its own national account sales and service division at your disposal, providing the complete proposition of a dedicated after-sales service package and a state-of-the-art Fleet Management System. Whether your operation demands engine power with low emissions and the lowest Total Cost of Ownership (TCO) or whether your business is suited to ergonomic, super efficient electric trucks, Doosan has the most modern and widest ranges to suit any application. In addition, Doosan has recently launched a new Fleet Management System, providing access to real-time fleet information on a 24/7 basis, ensuring customers are able to make informed decisions based on real time information and optimise their materials handling equipment. The IMHX exhibition 13 – 16 September is the perfect opportunity for you to come and experience this for yourselves. Doosan are able to offer customers the best of both worlds; all your materials handling requirements from one source. These services range from products, services, design, innovation, support, fleet management system and after-sales. 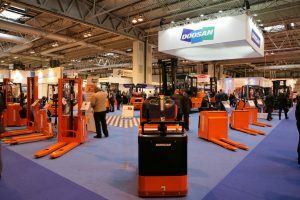 Doosan will be exhibiting the latest range of new and innovative products and services at IMHX 2016. Showcasing 16 trucks live on the stand, Doosan will be launching the new giant 25-tonne diesel forklift, the latest 7-Series 3 and 4 wheel electric trucks as well as displaying the award-winning Doosan G2 Euro Stage 4 compliant diesel engines all without the need for a DPF. For the first time ever, Doosan will be showing visitors the industry leading, Fleet Management System, which continues to assist larger fleet customers to manage their fleets more effectively and keep a handle on costs wherever they are located across the UK. With product introductions and demonstrations taking place throughout the week, this provides visitors with the chance to experience the latest forklift truck innovations first hand. The Doosan stand will be themed upon customer focus, ensuring that the journey and experience with Doosan is 1st class right from the start. We provide visitors with the best of both worlds – all your business requirements from one source – Doosan: design, products, customer service, maintenance, innovation, FMS and after-sales. The stand will be formed of sections, with staff members guiding visitors through the different zones, explaining the stages and introducing customers to ‘The Doosan Way’. This pathway allows visitors to interact with specific trucks dependent on their requirements, understand product developments, leading onto a live Fleet Management System with an interactive display, followed by a dedicated After-Sales and Parts area: demonstrating that Doosan provides the full service under one roof. Constant development of products ensures the latest concepts and innovations are put into practice, providing the highest quality and leading technology within the forklift truck industry to Doosan customers. Doosan has launched an online FMS website which allows customers 24/7 access. Each customer is provided with their own login details, enabling them to have complete visibility of their equipment and its history; this new online system allows customers to log breakdowns on a 24/7 basis, monitor uptime and fleet utilization, request and authorize quotes for repairs, as well as review accounts information. The major benefit here is that our customers can make informed decisions based on real time information, directly from a completely transparent system. High quality customer service is all part of ‘The Doosan Way’. Doosan ensures that customers are looked after from start to finish. Service is the most critical factor in keeping your business running. Doosan offers national coverage, at a level that is appropriate for your individual need. For large nationwide fleet users, Doosan has 150 mobile technicians to give prompt, efficient and reliable service. However, local and regional based businesses will take advantage of the best dealer-network in the UK, who have over 400 factory trained mobile engineers, right on your doorstep. Doosan will be hosting live entertainment on the stand from Ian Cook, owner of PopBangColour, a contemporary British artist internationally known for his unique methods, creating artwork solely using the method of radio-controlled cars, car tyres and toy car wheels as paintbrushes. 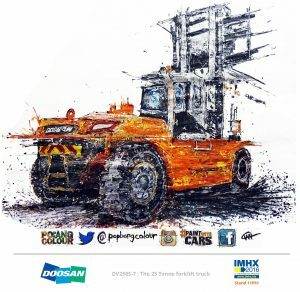 Each day at IMHX Ian will be producing a different painting of a Doosan forklift truck live on the stand, using radio-controlled cars, forklift truck models and Doosan forklift parts. Ian has worked on projects for Aston Martin, Jaguar, Alfra Romeo and Audi, as well as featuring on television shows such as The One Show, Top Gear and Blue Peter. Visitors will be able to watch Ian perform live at IMHX and be in with a chance of winning pieces of art work. 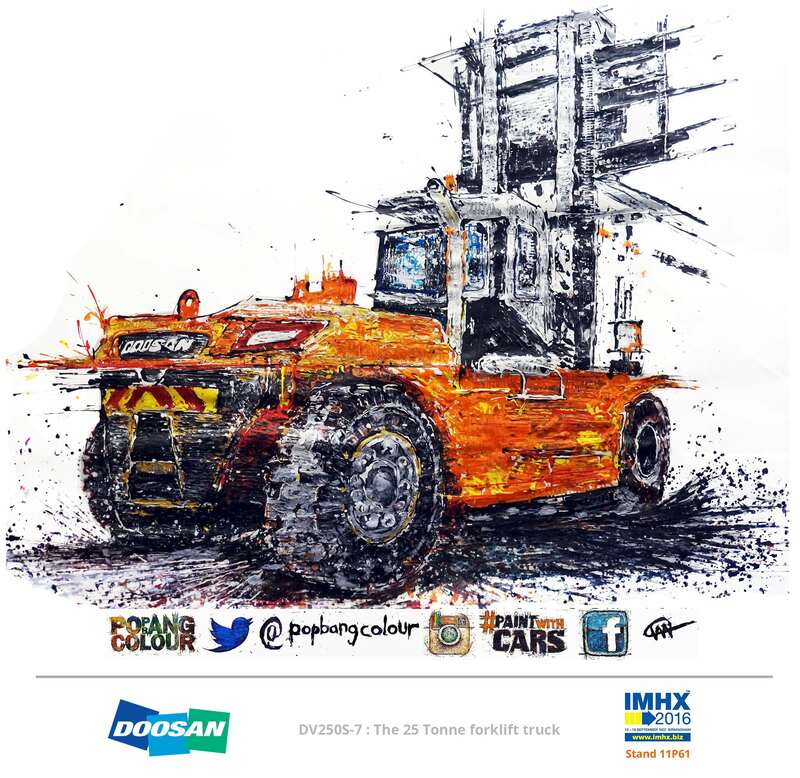 Doosan are delighted to work with PopBangColour, supporting a young, innovative individual, who works in an extremely unique way. Emphasizing, the ‘Doosan Way’, a philosophy focused upon people and the development of talent. With Doosan, you will realise that it’s not just about the truck, it’s also about you, the customer.